My painting, C-Shop, Coffee Shop at University of Chicago, is part of a group exhibit and competition, South Side Impressions at the Beverly Art Center, throughout this March. Chicago, including the Hyde Park area, is a fascinating subject for Midwest regional artists. This exhibit showcases the diverse world of the South Side of Chicago. Artistic impressions reflect the people, place, culture and landmarks. The Beverly Art Center is at 2407 W. 111th Street (corner of 111th street and Western Avenue), about 20 minutes from the Loop in Chicago’s historic Beverly Hills and Morgan Park neighborhood. The reception will be at the Atrium Gallery this Sunday, March 18, from 1-3 PM. Other Exhibiting artists: Gary Eckstein, Emma Grace Galvan, Brigit Goudie, Sierra D. Harris, Takiyah C. Harris, Valencia Hearon, Jack McCollam, Crystal A. McGrath, Fred Moss, Lindsay Sandbothe, Kyle Schneider, Pierre Seaton, Michelle Valenta, Robert P.Workman, and Regina Ziemann. The exhibit will be on display throughout March. If you are in town, hope you stop by. 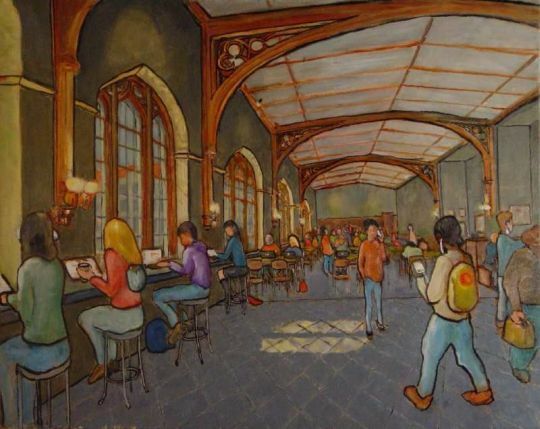 The C-Shop painting is part of a series of cityscapes of the Main Quadrangles on the University of Chicago campus. 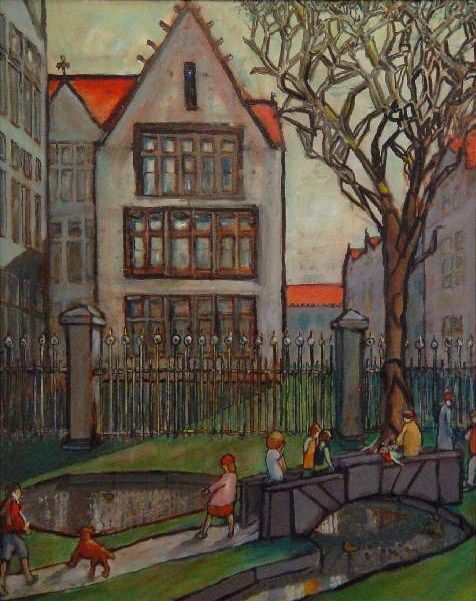 I’ve lived in Hyde Park for many years now and have enjoyed walking through the campus, picnicking at Botany Pond, and having a hot cup of coffee at the C-Shop on a winter’s day. I’m also an architect and my paintings are inspired by the beauty of the Gothic Revival architecture in the Main Quadrangle. The strong, stone buildings symbolize the enduring conservative traditions and stable framework of the university. In contrast, change is symbolized by the life and vibrancy of the ever-changing student population, illustrated with their multiple electronic devices, backpacks, and diversity. Last year I was honored by receiving first prize at the 2011 South Side Impressions exhibit for my painting, Botany Pond. Another current exhibit at the Beverly Art Center is well worth the visit, As They Like It: Chicago Artists Visualize Shakespeare, continues until April 1. This group exhibit includes more than 35 artists using diverse mediums to interpret Shakespeare — his characters, plays, or sonnets. Exhibiting artists: Rene Arceo, Jose Agustin Andreu, Tim Arroyo, Sharon Bladholm, Keith Brownlee, Mario Castillo, Laura Coyle, Michael Ferris, Chris Flynn, Jonathan Franklin, Anne Farley Gaines, Jan Spivey Gilchrist, Sergio Gomez, Fletcher Hayes, Alan Emerson Hicks, Preston Jackson, Robert Kameczura, Deborah Maris Lader, Kim Laurel, Richard Laurent, Diane Levesque, Carron Little, James Mesple, Geoffrey Novelli, Christina O’Connor, Joyce Owens, Mary Patton, Corinne Peterson, Tom Scarff, Charlotte Segal, Beth Shadur, Steven Sherrell, Eleanor Speiss-Ferris, Michelle Stutts, Frank Tumino, Maureen Warren, Kathy Weaver, Marzena Ziejka, and Jill Zylke.